As sweet as a spoonful of sugar, this beautiful brooch depicts the signature style of Mary Poppins. 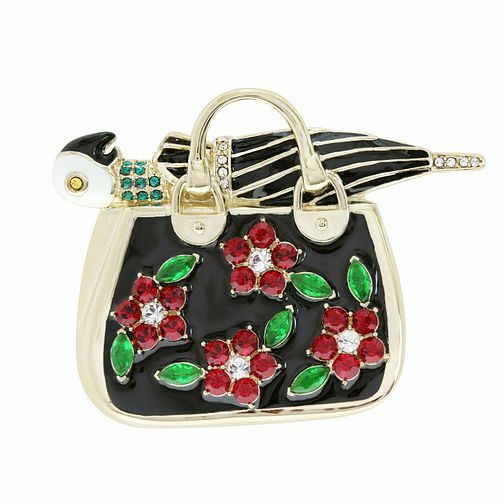 Her trademark umbrella and never-ending bag are delightfully presented, featuring red, green, black, blue and pure white crystals to add a magical shimmer and sparkle. Perfect for placing on a coat, jacket or bag, carry the magic of Disney with you. An ideal gift for a devoted Disney fan! Ever After Disney Gold Plated Mary Poppins Bag Brooch is rated 4.0 out of 5 by 1. Rated 4 out of 5 by Anonymous from Cute product The brooch is so pretty, comes in a nice box and then a small dust bag, unfortunately the dust bag is a bit dirty, looks like it has make up on it, but all good apart from that.